$3.95 Flat Rate Shipping | No Code Needed! The final wipe should be performed after you've already removed the majority of wax or sealant from the vehicle. The final wipe grabs any residual product and eliminates any streaks or smears to ensure the best possible finish. The technique is to wipe the paint slowly using your best microfiber polishing towel. Fold your polishing cloth 4 ways to provide plenty of cushion to help spread out the pressure from your hand over the face of the folded microfiber towel. Folding the towel creates 8 dedicated wiping sides. When one becomes covered in wax, you can switch to a fresh portion of the towel. The key to this technique is to move slowly to allow the towel to grab the wax or paint sealant residue from the paint. The surface of your vehicle looks flat and smooth to the naked eye, but a microscopic view of the surface reveals hills and valleys, pits, pores, and interstices (microscopic gaps and cracks in the paint). Trace residues of products can remain in the low points of the paint surface even after it appears you've removed it all. Only slow, steady movement with a high quality microfiber towel will remove the trace residues. Fast wiping just doesn't allow enough time for the residues to transfer to the microfiber. Instead, move the polishing cloth slowly over the surface to enable the microscopic sized fibers to get into the low points where the residue will have time to transfer from the paint to the cloth. The final wipe not only removes trace residues, it eliminates streaks that show up on dark paints. After laboring over a vehicle for hours, the last thing you want is to do anything that could potentially cause any new swirls or scratches. That�s why, as you progress through the process, after each step you have to be more and more careful when wiping off any compounds or polishes. The towels you're using should be of a higher and higher quality as you work through the process. 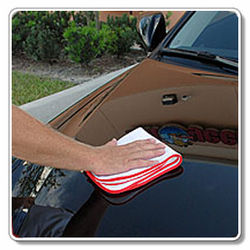 The buffing towels used at the end of the detailing process should be the softest you own! Rushing at the very end doesn�t make sense. You could instill swirls and scratches because you�re wiping too quickly or not using your best quality polishing cloths. Save yourself time and effort by doing things slowly using the right tools. Do it right the first time and you won't have to go back and fix it. Show car work demands focusing on the task at hand and using your best skills and your best tools to reach the goal of a flawless show car finish. Ultra-plush with non-scratch edging for swirl free detailing! Maintain perfect shine in minutes. Just spray & wipe!